We're rehearsing while the servant girl sleeps. Anyone have any hints on how to get all your feathers in to a neat little bun at the back of your neck? A shawl would be nice, too. This is my favorite one so far! So many textures to look at! I didn't know fungus could be like this! Thanks a lot! I like so much fungus! I have a lot of it in my garden. Susan, your photos are truly amazing. I love the last sunset of 2005, beautiful ! I can tell you are enjoying your new camera. Hmmmm. Don't you think it would be easier to lay some eggs if you weren't all dressed up and dancing????? Thanks. I, too, like all the textures and tiny details in this photo. You're very welcome, and welcome to the farm! Thanks for the link; I'll have to check it out. thank you. Yep, I am definitely loving my new camera. 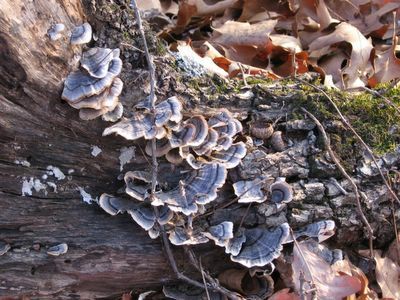 That fungus is called turkey tail and it's actually medicinal! Great photo.